Keratosis pilaris can be compared to acne, except for the fact that it commonly occurs on your upper arms and thighs – not your face. 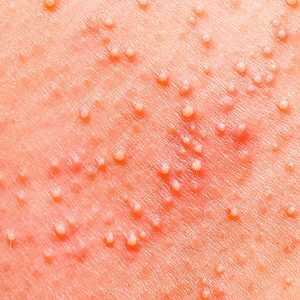 This rash is caused by dead skin cells that plug up the pores around the hair follicles in these areas. Sometimes keratosis pilaris itches, but in most cases it is more annoying than anything else as it gives your skin a sand-papery feel. The main cause of keratosis pilaris is dry skin. Because of this, it generally worsens during the wintertime. It can occur in both children and young adults, although people of all ages may suffer from it. Since keratosis pilaris is benign (not cancerous) its treatment is mainly for cosmetic reasons, not medical ones. Keratosis pilaris is treated with a specific skin regimen that consists of a moisturizer to handle the dry skin and a prescription skin clearing cream such as those prescribed by dermatologists for use on acne. As long as the skin care regimen is followed, your skin will remain clear, however, keratosis pilaris can come back when the treatments are stopped.